The former political aide said she felt "attacked"
In this Oct. 12, 2017, file photo, Omarosa Manigault Newman is seen in the East Room of the White House. She aired her feelings on the Trump administration on the second episode of "Celebrity Big Brother." 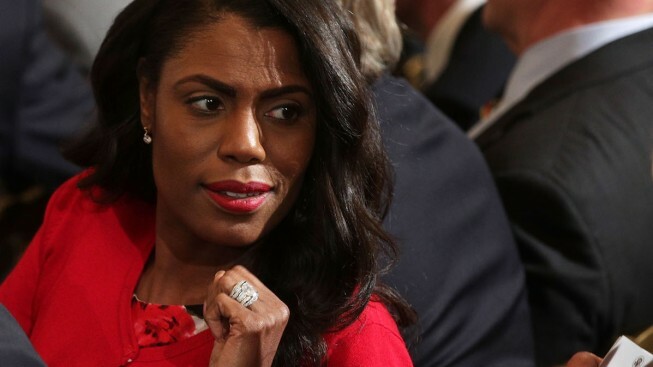 Former White House staffer Omarosa Manigault-Newman got closer to telling more about her experiences in the White House, saying that she was "haunted" by President Donald Trump's tweets "every single day." On the second episode of “Celebrity Big Brother,” housemate Manigault-Newman broke down and talked about her time as a member of Trump’s administration, which she exited in December 2017. Two months later, the former "Apprentice" star is now appearing as part of another reality cast. With tears in her eyes and speaking in a whispered voice, Manigault-Newman talked about how Trump’s tweets had affected her. Manigault-Newman said she tried to be the person to approach Trump and voice her worries, but “all of the people around him attacked” her. “It was like keep her away, don't give her access, don't let her talk to him,” she said. Manigault-Newman has pushed back against reports that she was fired. She appeared on "Good Morning America" in December to talk about her exit, saying she resigned after sharing some of her concerns with White House chief of staff John Kelly. On "Celebrity Big Brother," the former communications director for the Office of Public Liaison went as far as saying, “It’s not my circus, not my monkeys," explaining she has no more power in the White House. But she added: “I’d like to say not my problem, but I can’t say that because it’s bad." In a White House press conference Thursday, Press Secretary Raj Shah responded to the clip by reminding viewers Manigault-Newman "was fired three times on 'The Apprentice' and this was the fourth time we had to let her go. She had limited contact with the president while here. She has no contact now." This season of “Celebrity Big Brother” has 13 episodes shown in 13 days over a course of three weeks. The premise of the show revolves around celebrities, called housemates, in a residence isolated from the outside world. The housemates are then voted out periodically. The winner of the show wins a sum of money that it is typically donated to a charity.